I just finished writing the software which tracks your emotions using brainwave analysis. From a flashcard-style test, it creates a custom video for each participant from a melange of silent clips such as balloons floating in the sky, a tapping foot and an angry dog. This weekend Flux Factory along with The Metric System will be presenting The Science Fair, (New York), where I will showing After Thought, whichÂ I developed as aÂ resident artist at Eyebeam Art + Technology Center. This project expands my deep interest in personal emotional spaces created by video. My first exploration was with Future Memories in 2006, which sources the “in-between” shots from Hollywood cinema to create a series of black-and-white videos which evoke feelings of displaced familiarity. 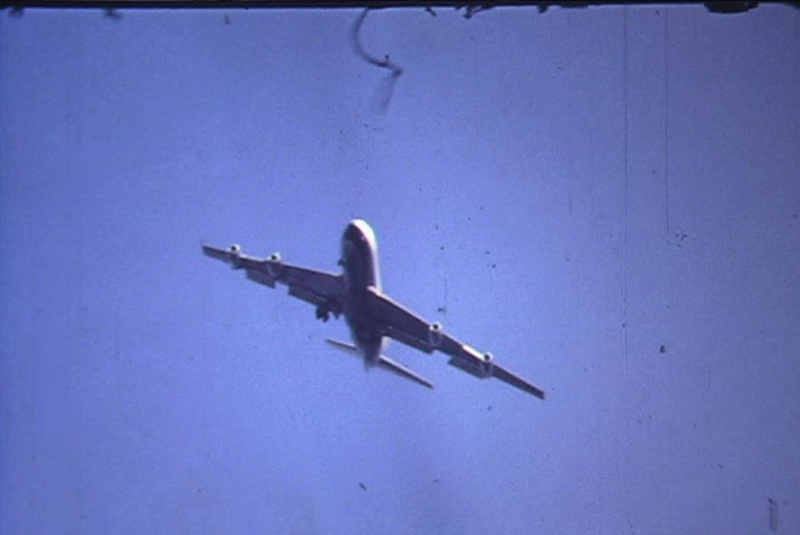 With my Home Stories (2008) project, which I call an “experimental narrative,” I use a silent, looped 5 minute edit from assorted 8mm home movies (including my own parents, now deceased) and invite 5 different storytellers to come up with narratives for the video. I’m excited to see the possibilities. If you are in New York this weekend (June 5-6), you will be guaranteed a memorable experience by coming to The Science Fair. New documentation! During my 6-month residency at Eyebeam, I worked on about 6 different projects. Two of them: Hatch and After Thought are now documented on my site. Hatch is the first of a series of acrylic plexiglass installations. This one depicts a mass of sperm (up to 200!) which swarm around a doorway. This was cut with the Eyebeam’s lasercutter, can be site-specific in its installation, and is cheap to ship. After Thought is the most experimental of my individual works. Here, I use a Neurosky Mindset to test people while they look at flashcards of charged imagery. I monitor their responses in a subjective application of science, noting their responses on an indicator sheet (below). After their test, I feed their results back into video generation software that I wrote which makes a custom video (5 minutes) that reflects their emotional state of mind. Another artist that I am close friends with, Luther Thie, uses the same headset for the Acclair project in compelling but conceptually different repurposing of theÂ brain to computer interface (BCI). We are making good progress on the Open Video Sync project. It’s buggy but the syncing code works! After some thought about how to best make this available to a wide set of users and support some of Apple’s undocumented APIs â€” ones that are basic like pausing a movie or playing it back on an external device, (see this thread for the geeks out there) we have decided to release two versions of Open Video Sync, one for App Store which will be a slimmed-down version and one for the Cydia Store â€” forÂ jailbroken phones, which will be a full-featured version. I’m still disappointed with Apple and their closing down of the iPhone. But apparently I am just one of many. Open Video Sync is one of my Eyebeam projects and will be a way to turn your iPhone or iPod touch into a cheap and wireless video synchronization tool. We have unfortunately come to the conclusion that we will have to release this as a jailbroken application which means it will be released on the Cydia Store rather than the Apple Store (here is a glossary of what these terms mean) which means restricting the audience to a more tech-savvy group, but there is no other way. The bone of contention is the use of undocumented interfaces and there is specifically one called the MPTVOutInterface which lets you playback video onto an external device. Apple doesn’t support this for the development community which is a foot-shooting maneuver. First of all: any video player should have a direct-to-device output. In fact, here is a great iPhone hardware hack that will let you do just that. Second: this is already something that works for Apple’s own iPod video player. It is well-tested and should be folded into the general API. The shoot-in-foot problem is this: it is only a matter of time before the open source Google Android phone catches up. Right now, it still lacks the necessary inter-phone communication via Bluetooth/wireless API. And also the phone is too expensive, requiring a service plan. The iPod touch is an excellent model: cheap, great UI and a lot of application support. Hopefully the Android will come up with a similar model sooner than later. Apple could profit from iPhone-as-gaming device such as this example. In the meantime, my co-developer, Eric Brelsford and I have decided to jailbreak and go Cydia on this one.Â Stay tuned. As part of the Postgravity Art: Synaptiens event which invites hour-long interventions into a 50-hour performance cycle, I will be enacting a two-person performance: Space Age Love. Here, Victoria Scott and myself will be floating in space — in Second Life space — and communicating via chat, while our cameras point at one another and our astronaut avatars perform acrobatics. The two viewpoints will be projected onto the Synaptiens structures at Eyebeam. This is happening today (Nov 12 2009) along with performances at 2:30 by Jamie O’Shea and 4:30 by Rashaad Newsome. I call this an auto-biographical performance as the two of us are floating between San Francisco and New York, working out opportunities, desires and finances to find a home. The chat will be entirely improvised, discussing these issues in live space at Eyebeam. This is a more readable diagram than the chicken scratch one I wrote last Friday. This shows the Open Hardware modular component design for the custom LED projectors that I have begunÂ prototyping at Eyebeam. The gray boxes are the mandatory components and the white ones are optional, depending on the design. The idea here is to let others come up with better battery systems and LED bulbs but still keep the structure of this project intact. Incidentally, if you are looking for a good Arduino startup kit, check this one out from adafruit — just $50. I just ordered one as a prototyping tool for things such as the PWM for the LEDs. I’m excited to be one of the Resident Artists for Eyebeam this Fall along with the other artists: Diana Eng, Nora Ligorano & Marshall Reese, Rashaad Newsome and Marina Zurkow. Today marks the end of my first week: getting oriented, research, setting up my workspace and more — a real treat to be in Chelsea and part of an amazing organization that has funded and assisted so many artists as well as public programs for students and much more. For the last 3 years, I’ve been focused on a studio practice in San Francisco which has been developing many individual works including popular video and prints including Future Memories, Uncertain Location, Video Portraits and Paradise Ahead, along with several collaborations such as No Matter, Wikipedia Art and Second Front. While this period has been prolific and fruitful, I could feel myself straying from my roots of community activism and group collaboration. Here at Eyebeam, I will be developing some open source and open hardware technologies which will enable mobile and networked video projectors using LED bulbs for power. It is ambitious, I know. But, I think this is an amazing and prescient technology that will soon be ubiquitous. I’d like to make the means available to modification and customization by artists and others. I have my own ideas for several projects which could use mobile and cheap projection systems which can synchronize video channels. So far, my favorite links for the build-your-own projector community has been the one at Lumen Labs which is a storehouse for ideas and conversations. Additionally, there are some useful examples on Instructables and on engadget of DIY projectors. Most involve ripping apart off-the-shelf components and modifying them to make them into home-brew projectors. Remember that the DIY projector is different than the open hardware designs. Here is a crude diagram, which illustrates my poor handwriting, of a general design for opening up the hardware I want to make a design that is cheap, modular, open and effective. All of this for less that $500. Each unit will be able to be synchronized using custom iPhone software that I will write during my stay here (more on that later).